“Going There”…and Hopefully Bringing Others Along With Me! I thought for sure my first post would be about my classroom library and books. My library, which takes up my entire classroom, is my pride and joy. I’ve worked hard to make it my place of zen (to borrow from Amy). But it is also my comfort zone; helping students find books they can connect to is one of the few things I know I do well. In the first two weeks of school, I’ve experienced the familiar joy and success of matching students with books. I’ve connected with students who are devouring books at breakneck speed. I’ve also gladly and eagerly taken on the challenge to find that perfect book for the stubborn “I don’t read” holdouts. This challenge energizes me like no other! But I have taken on another challenge, and that is what I want to share about today. 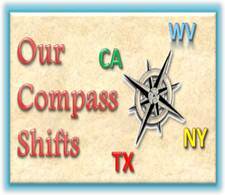 Given I am part of the “Our Compass Shifts” project, you all know that this summer I took a class with Penny Kittle at #UNHLit13. [I will save my fangirl post for another time!] That class totally CML* (Changed My Life). I received affirmation, direction, and practical ideas on how to shift my class to a reading and writing workshop model. But the most important experience from the class was becoming reacquainted with the struggle and vulnerability involved in authentic writing. Our final project was a non-fiction narrative piece incorporating information or research. I chose to write about my grandfather’s suicide five years ago. I knew it was the story I needed to get out, but as my friends can testify, my writing process was mildly torturous, fraught with resistance, paralysis, and self-doubt. In the end, I “went there” (in the words of Erika, aka “Brooklyn”). I poured much of my own self into the piece, and crying through the read-aloud to my newfound friends and Professional Learning Community took a lot out of me emotionally. It was cathartic, to be sure, and in some ways the beginning of needed processing and healing, but I realized that if I want my students to write the stories they need to get out, I am going to have to commit to “going there” with them all year through writing beside them. I wasn’t sure if I was ready for it! 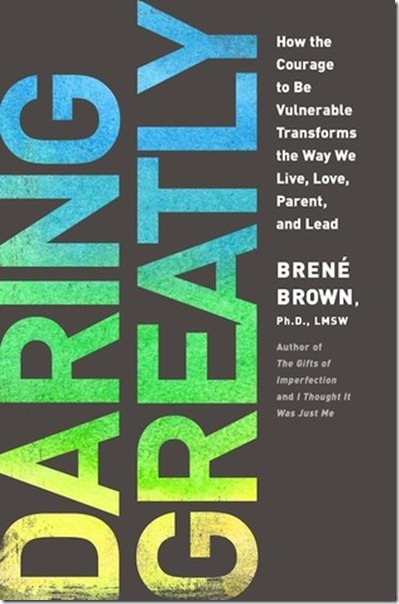 Right before school started, I began reading a book called Daring Greatly: How the Courage to be Vulnerable Transforms the Way We Live, Love, Parent and Lead by Brene Brown. [Aside: If you haven’t seen her amazing TED Talk: “The Power of Vulnerability“, you simply must!] Right away, I knew this was a book I needed to read. I started highlighting like crazy, typing out quote after quote. Brown defines vulnerability as “uncertainty, risk, and emotional exposure” (34). What’s more vulnerable than “going there” in my writing, and then sharing it with others? This summer I learned that I need to model process, not product. That means tons of vulnerability before my students. My first opportunity came the fifth day of school, as we were writing in response to the poem “Days” by Billy Collins. I chose a particularly happy day from my junior year of high school. 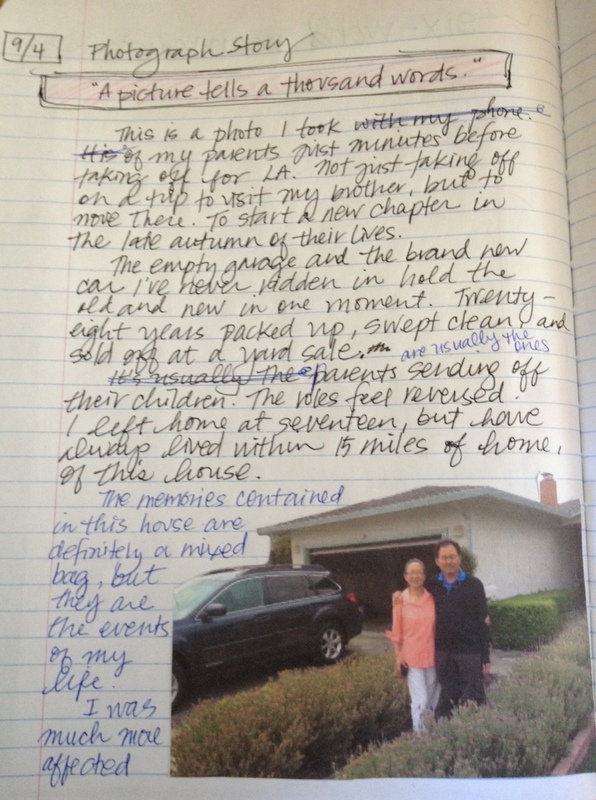 As I talked through my own writing process, I showed my students that as I wrote, I remembered more details. My goal was to show my students how you can start out writing one thing, but find kernels of other stories during the process of revision. Through the process of rereading, I noticed a particular detail was much more significant than I had thought initially. In fact it was ominous foreshadowing of the tragic loss of my dearest friend to suicide a year later. But as I explained this, I ended up choking up and crying in not just one, but all five of my classes that day. Initially I felt embarrassed and really…vulnerable. I was most definitely emotionally exposed before 150+ young people I had basically just met. People I had been entrusted with the responsibility of teaching this year. But later that day I came across a particularly timely gem in Daring Greatly. Brene Brown’s vulnerability prayer is “Give me the courage to show up and let myself be seen” (42). I was able to push out the feeling of embarrassment and worry that my students perceived my display of emotion as weakness, and instead recognize it took courage to let myself be seen by them that day. I didn’t only model for them my writing process, but I took the risk to be the first one to “go there,” and modeled placing trust in the safe space of the community we were beginning to build together. Taking that first step has made it easier for me to continue writing authentically with my students. This summer, I circled around the topic of my parents moving away, the difficulty of my relationship with my father, and the “grief” of saying goodbye to my childhood home. I wasn’t ready to write about it then, but I began to today. I’ve experienced personally how courage begets courage, increasing connection and building community. Accepting the challenge to write through my vulnerability, rather than resist it, has signaled to my students that it is safe for them to go there as well. And though I haven’t won over everyone yet, there are definitely some who are beginning to take the risks to tell the stories that matter to them. The stories only they can tell. *You will get used to some of my go-to initialisms! Isn’t it interesting that we shared experiences? I cried writing with my students, too. Evidence of authenticity at its finest. I feel closer to my students in just 9 short days than I felt to my kids all last year. Magic happens when we write from the heart. Thank you so much for sharing yours here. I so want to read more from you! It’s as if we are sitting in the UNH cafeteria this morning conversing around yogurt, eggs, and fruit flavored water, on our way to class! Your voice in this piece brings me back to the two weeks of laughter, vulnerability, and life changing journey of our brief time together. You are a stellar writer and your students are going to rise to the same standard…because with vulnerability there’s no other way :). Proud of you, CA. EMILY!!!!!!! So excited to read your writing once again. I immediately started giggling at your abbreviations (CML). I’m glad you have worked up the courage to be vulnerable in front of your students. It’s important and special and they will love you for it, just like we all do after hearing your writing at UNH.